TECHNOLOGY-All That Matters Today: How did Facebook spread out and took over Orkut in INDIA ? The most powerful thing today is 'INFORMATION' and technology is the carrier of all this to all of us... This simply means TECHNOLOGY is the most important thing today... so here I will make post primarily about technical help, my current (own)work & of course cutting edge tech issues... So stay tuned...! How did Facebook spread out and took over Orkut in INDIA ? Hello folks I am back again with some new tech talks. Lately I have been going through some articles on the ReadWriteWeb and I came across some interesting post. It depicts the growth of Facebook and the demise of Orkut in the world. As we can see from the above picture, Facebook is the highly dominant Social Networking site in India in Dec 2010. But back then in time of June 2009, the picture was something different as shown below. I still remember the Q1 of 2009 (the first quarter of 2009), I was in the 3rd year of my degree course of Computer Studies at PICT, all of my friends and everyone in the college was crazy about Orkut. They used to sit for long hours in days and nights in front of their boxes playing those fancy games made into Flash.They used to sit long just for the desire of breaking the records of the games which determined the typing speeds, the games which enabled them slap their friend in their network. 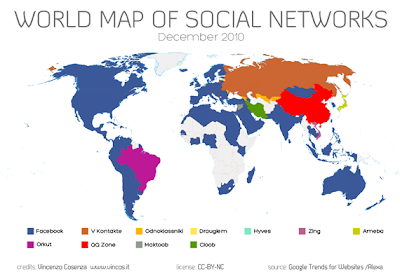 The world seemed to stay within the then Social Network, Orkut. The time changed and things tend to get worse for Orkut, people began to hang out on a new Social Network which spawned in the name 'FACEBOOK'.It started to burgeon out rapidly in INDIA. People began getting addicted to this new mania. Orkut seemed to begin becoming history. I still remember those 'Likes' and 'LOL's people used in their usual gossips too. And now theres hardly anyone who logs into Orkut, I dont even remember when was it the last time I had logged in into Orkut. But the time changes for everything. The time comes for everything to end someday. Today its Facebook, the Social Networking Giant, might be it will be something else tomorrow. Who knows how the time passes along and what is in there destined for all of us. When and How to innovate.? Are desktop computers Obsolete or Dead?